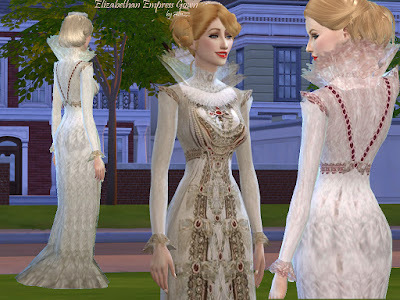 This is a dress inspired by the Elizabethan Era, is perfect for an empress! It has a parlet, that see-through neck detail that we see in this period gown, and see-through cuffs at sleeves. Comes in 16 colors. The original mesh is by Sims4Nexus, and I did a small modification to it to make some parts transparent like the neck frills (parlets) and the sleeves cuffs :), that is why the mesh is included in my file. Thanks Sim4Nexus for the original mesh and beautiful downloads. Thanks dear Nicole! And sorry for the delayed answer. I was not up with the blog last month! Thanks! This is an absolute beauty!! Thank you for sharing!